Making the world a wordier place. I read a nice essay by Katherine Whitehorn in the Observer Food Monthly once, on eating alone. I’m not sure if I eat terribly differently when I do it alone. I know that, of necessity, what with me being a news widow and all, I eat a lot of my meals on my Jack Jones. I don’t think that there’s a huge difference between what I do by myself and what I do in company. Last week, for example, I had a fairly elaborate stir-fry with deep-fried tofu and miso soup drunk from a bowl on the side. Tonight I am having roast butternut squash with some black-eyed bean mushroom sauce thing. Not deliberately over-elaborate with candelabrum, polished silver and stiff linen like M. Blanc, then, but not an ascetic’s dinner either. I might experiment with stuff a bit more if it’s just me, but I definitely don’t shovel hunks of cheese or slabs of chocolate down my throat. Or rather: I do, but that’s as well as and not instead of. It’s a 1963 Penguin, inscribed with the message “Oct-’77 To Martin from Mum with love.” (Nothing to do with me.) I used to own two copies, but gave the more recent one, with a cover like this, away. Again, not sure where I acquired this volume, or the other one for that matter: probably Colchester (post-graduate with plenty of time on hands + not much money + surfeit of charity shops = fantastic second-hand book collection). I do remember very clearly, however, the first time I ever encountered this book. It would have been sometime around 1989, when I was at Oxford, and sharing a house with the scion of a minor branch of a major family. He had been given it as a gift and I read it avidly because, more than Entrance Exams and subfusc and boys from Eton and ivy-filled quadrangles and girls actually – actually! – called Cordelia, it gave me a clear insight into the ways of the middle classes, and made me realise they are quite different from us. First of all, the acknowledgements credit Elizabeth David, which is a dead giveaway, because Britain is divided by the post-war cookery book: David, or Marguerite Patten. Will you be cooking courgette and herb risotto or mushroom-stuffed eggs when the revolution comes? This was a world that was alien to me, and which always will be to some extent. It was a world of dinner parties (still a novelty for me in ’89). A very U world indeed where “paper napkins” are only “socially O.K.” when handing round hotdogs. And this – this is the bit that has stuck in my mind after all these years – was a world where parents sent spies round to check on you. Whoah. Your parents deploying someone else to poke their nose into family affairs and see if you are behaving? Worse. Having your parents’ friends round to dinner? I still think that’s weird. 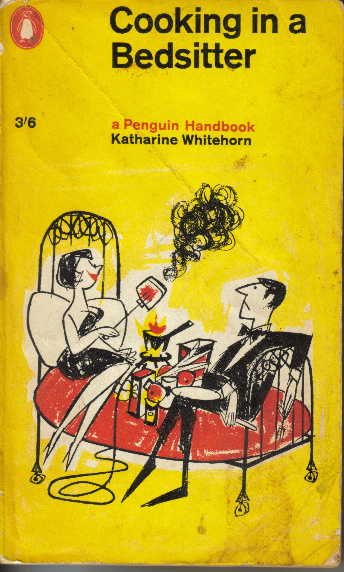 Although I love the way that Whitehorn writes, peppering the text with anecdote, illustration, literature, other cookery books, there’s something about the whole thing that scares me slightly, like having your tea round your teacher’s house. 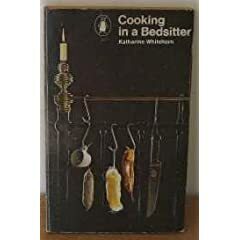 Have I cooked anything from this book? No. And I’ve always wondered whether lots of people really did knock up Haddock Monte Carlo on a two-ring. And if they did, what did it really taste like?